It began with the pie. 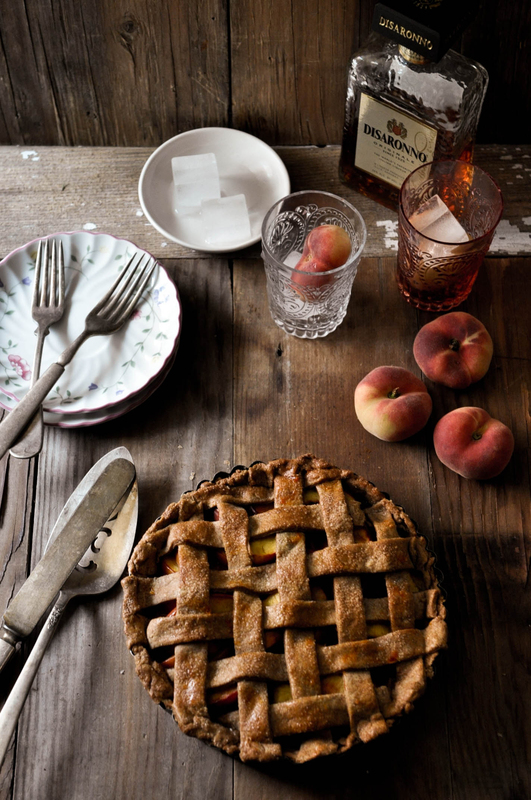 A fresh peach pie with a touch of amaretto encased in the wholewheat crust and trussed up in lattice. It smelled heavenly when it came out of the oven and I carried it with a wide smile to my table in anticipation of the perfect shot that would deliver the message of how perfect the pie is. Then I stood there, oh for a few minutes, camera in one hand, the other resting tentatively on my hip, staring at the pie and my smile slowly faltering. The pie, gorgeous as it was, was rather humble from a styling perspective. Very cozy and comforting to look at in real life but, through my lens, looked rather plain and drab on its own. I racked my brains, used different surfaces as backdrops, threw a few haphazard towels about in an effort to build on the rusticity. Na! I wasn't happy with any. Mind you, by this time, it was striking cocktail hour ringing in the weekend. In other words, it was a Friday evening of a long and tiring week. I was beginning to pout from all this stress of NOT getting my money shot. 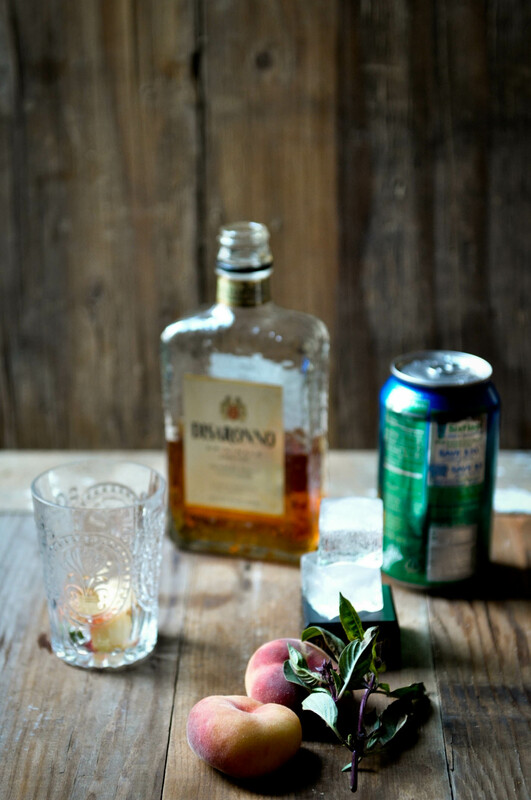 So, I muddled a bit of the sweetest of the fruit and basil, added a dash of liqour, poured some soda and tested it. Too sweet. Everything in that was sweet, no surprise. So, next attempt, squeeze a bit of lime to cut the sweetness. Ah! Yes, that was it. I had to try a couple more just to be sure. By this time, I nearly forgot my pie and the sun was fast shimmering away for the night. Fortunately, I managed to style and shoot my dish and drink in the remaining evening light for your enjoyment. Oh! It was mine too. 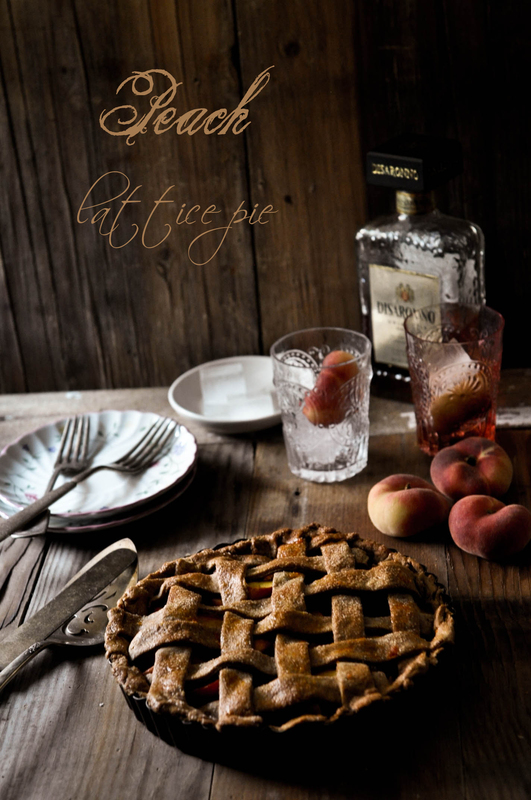 The pie is light and flavored entirely by the sweet juicy peaches tossed in a touch of honey and amaretto and a sip of the the cocktail with the pie layered on the peachy perfect sunset! Well, that is really the story for this cocktail. The few more knocked back later, in celebration of the genius idea, are beyond the scope of this post... Lets just leave it at that! 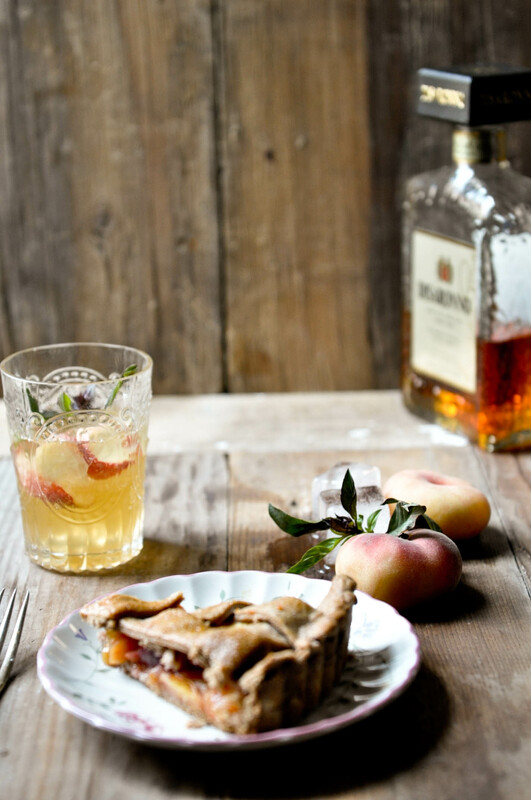 Toss the peach slices in honey and amaretto and set aside. Roll out one portion of the tart crust and fit into a eight inch tart mold. 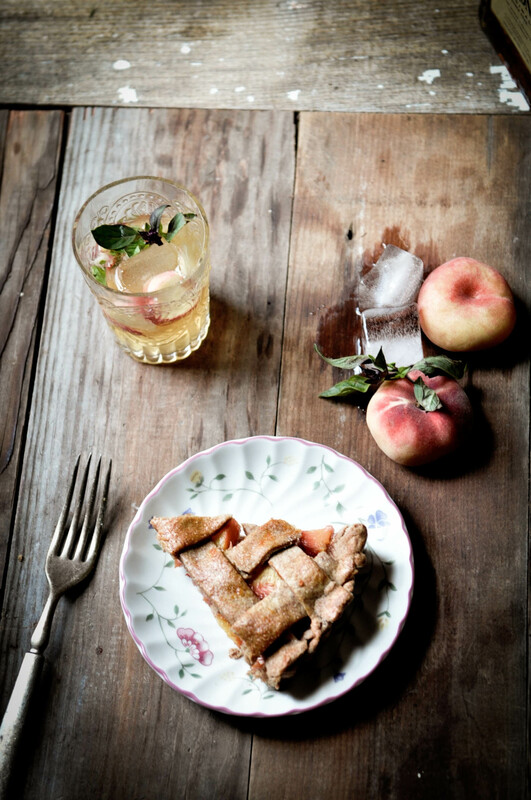 Fill the tart with the reserved peaches. Roll out the other crust dough and cut half inch thick strips. Place the strips in a lattice pattern on the peaches. Brush the top with egg wash and sprinkle the sugar on top. Bake for 35 minutes until the crust is crumbly and golden brown. 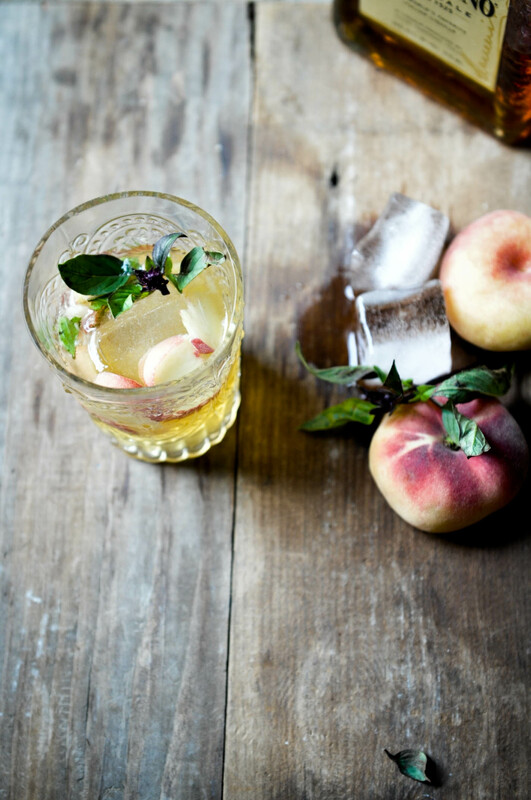 Muddle the peach and basil with the lemon juice. Add the ice cubes and top with soda. 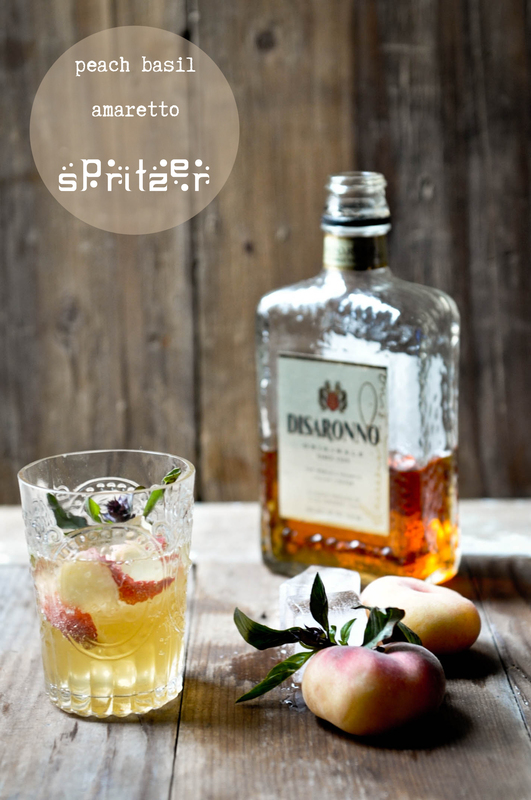 Serve with sprig of basil and slices of peach as garnish.